Obverse: A woman in national costume, holding a cornucopia a symbol of wealth and prosperity. This woman is an allegory of Lithuania as a modern country, with growing industry and developed agriculture. (The woman on the 100 litas banknote of 1928.) Below are the symbols, meaning the spirit of the nation and the national identity: the spinning mill (folk crafts), the sieve, the plow, the sheaf of wheat (agriculture), the globe (travel, research), the palette (art), the compass (architecture), books (education), a kid with a caduceus in his hands (the key symbol of secret knowledge). In lower left corner is the stylized coat with The Columns of Gediminas or Pillars of Gediminas. Under the symbol is the inscription: "VIENAS LITAS TURI 0,150462 GRAMŲ GRYNO AUKSO" ("One Litas is equal to 0.150462 grams of pure gold"). Signatures: V. Jurgutis, J. Paknys, Julius Kaupas, Z. Starkus, P. Grajauskas. Reverse: The Bank of Lithuania building in Kaunas. Denominations in numerals “100” in ornate guilloche are in each corner and in words "SIMTAS LITU" at bottom center. Watermark: Kestutis, Grand Duke of Lithuania. Most likely many have seen, and might even have, a 100 litas banknote issued in 1928. 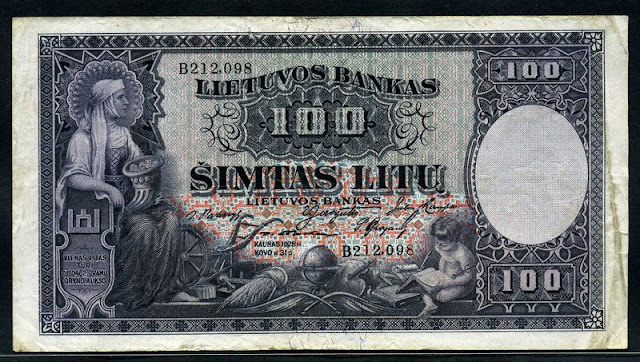 It features the buildings of the Bank of Lithuania in Kaunas, the construction of which had just been completed, while on the front of the banknote — a woman in national costume, holding a cornucopia. This woman is an allegory of Lithuania as a modern country, with growing industry and developed agriculture. It is interesting that this woman is not the fruit of the fantasy of the artist Adomas Galdikas, but a real person! 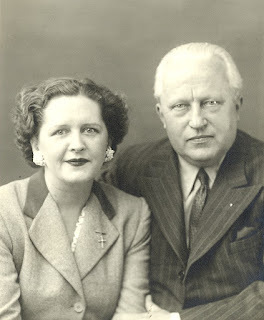 She is Elena Turauskienė — wife of Edvardas Turauskas, a Lithuanian diplomat, public figure, press employee. She posed for the artist Adomas Galdikas in 1927. Elena Turauskienė was born on 15 March 1906 in Paris; she was the elder daughter of Jurgis and Elena (Jurgelionytė) Jankauskas. Elena met Edvardas when he arrived in Paris to study law at the Sorbonne. 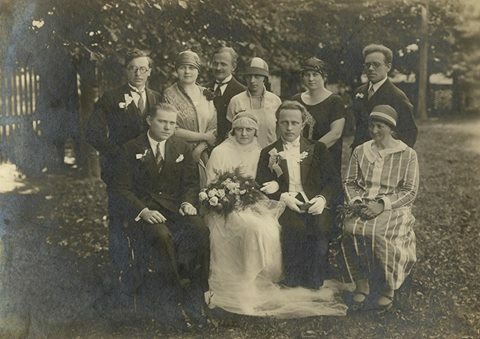 They got engaged, Edvardas returned to Lithuania and organised their wedding ceremony, while Elena alone returned to Telšiai, where her family was waiting for her. The couple got married on 8 August 1926. Edvardas Jankauskas worked as a senior editor with the Rytas daily newspaper, director of ELTA, was an Envoy Extraordinary and Diplomatic Agent to Czechoslovakia, Yugoslavia and Romania, and resided in Prague. During the war the couple retreated to the West. This romantic story about her aunt was told and family pictures were kindly shared by Karolina Masiulytė-Paliulienė — a Paris-born actress, granddaughter of the book smuggler Juozas Masiulis. Elena Turauskienė was her mother’s sister. Currently Karolina and Arūnas Paliulis live in Vilnius. An international competition for the design of the Bank of Lithuania building was announced in 1924. The terms and conditions of the competition laid down that the building and all its parts were to be erected on a 2,762.5 sq. m. site at the intersection of K. Donelaitis and Maironis streets; the central facade was to be from the side of Maironis street. Architectural firms and individual architects applied to the Bank of Lithuania, offering their services. The greatest interest in the competition was shown by German firms: Heinrich Reuters & Co, Nixdorf & Reissmann Architekten B.D.A., Hans und Oskar Gerson Architekten B.D.A., architects Paul Fischer, Hugo Steinbach, Max Heil and others. The three best works were to be awarded prizes: first place — 10000 litas; second place — 7000 litas; third one — 5000 litas. The deadline for submitting the designs was set — 10 June 1924; the competition was planned for 20 June. The Board of the Bank of Lithuania approved the competition commission, which consisted of three persons: professor Mykolas Songaila, engineer Jonas Šimoliūnas (1878–1965), and professor Vladas Jurgutis. Competition participants from Lithuania, Germany and France presented many interesting designs for the buildings of the Bank of Lithuania. First place went to an architect from Paris (surname unknown). The building designed by him was very modern, complex and expensive; it was therefore decided to partly modify and add on to this design. This was done by the architect M. Songaila, with the assistance of Arnas Funkas (1898–1957), Feliksas Vizbaras (1880–1966) and others. The cornerstone for the Bank of Lithuania was laid on 12 March 1925; the consecration ritual was performed by Prelate Jonas Mačiulis-Maironis(1862–1932). The process of construction involved Lithuanian and foreign firms; local and imported construction materials wereused. The construction of the approximately 6,000 sq. m. building lasted for more than three years. The completed Bank of Lithuania was consecrated on 8 December 1928 by Maironis. working instruments and manufactured items — allegorically depicts Agriculture, Industry and Warfare. Through a spacious lobby one enters the two-storey. Banking Operations Hall, which is surrounded by a Corinthian colonnade with galleries on the first floor. Flanking the hall — customer service booths and service spaces. The central Banking Operations Hall is lit from above; it occupies an area of 700 sq. m., of which 370 sq. m. are for customer service. Customers could approach 48 reception windows. Three armoured vaults at the Bank take up an area of 280 sq. m., safes with 3,000 boxes — 90 sq. m. The premises are equipped with a modern alarm system, central heating, a complex ventilation system. The vaults equipped under theOperations Hall can be accessed through a massive door, weighing 3 tonnes, which was produced by the English firm Milners and has survived until the present day. The angular part of the second floor-attic from Maironis Street had an 8-room apartment for the then- Prime Minister Augustinas Voldemaras (1883–1942) with an entrance hall, library and premises for official receptions, a separate main entrance, an elevator and alternate staircase. The premises for official receptions are a two room banquet hall with a small balcony for the orchestra. The office of A. Voldemaras is ellipse-shaped, with an 8 m. high dome, decorated with caissons and rosettes. On the second floor of the building from K. Donelaitis Street an apartment was furnished for the Bank’s Governor. On the roof terrace, surrounding the large triangular skylight of the Operations Hall, a garden was planted. The buildings complex contained 11 flats and 4 separate rooms for lower-ranking employees, 6 garages, laundries and bathrooms. The expenses for the construction of the Bank of Lithuania’s buildings amounted to 6.4 million litas. When the Soviet Union occupied Lithuania on 15 June 1940, the country’s central bank was nationalised and made the Lithuanian Republican Office of the USSR State Bank, while the branches of the Bank of Lithuania were restructured into the branches of the USSR State Bank. 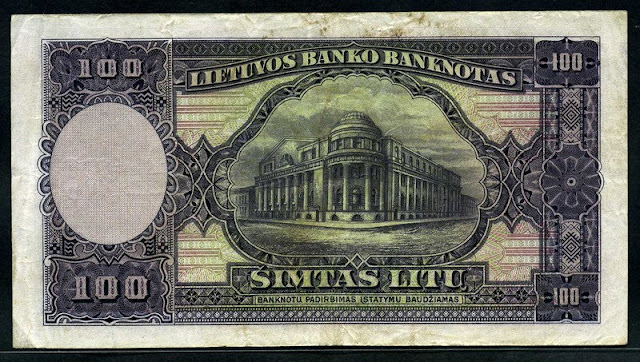 On 25 March 1941, the circulation of the litas was banned, while the litas banknotes that were stored in vaults were burned in the furnaces equipped in the building for currency destruction and heating. In 1970, the building was included in the list of architectural monuments. In 1988 the Lithuanian Republican Office of the USSR State Bank was renamed as the Lithuanian Republican Bank of the USSR State Bank; hence, the Kaunas branch of the Lithuanian Republican Bank functioned in the building. In 1991, the building was transferred to the Bank of Lithuania, established on 1 March 1990. The premises were restored and reconstructed, their authentic interior and original colours were also restored. In 2003 the buildings were proclaimed as being a cultural monument. The purpose of the buildings — serving bankers — has never changed since the day of their construction. Today, the central office of the Bank of Lithuania — the central bank of the Republic of Lithuania — is based in the State’s capital city of Vilnius. The Bank’s buildings in Kaunas had until 2012 housed the Bank of Lithuania’s Kaunas branch; presently they house the Cash Handling Division of the Cash Department of the Bank of Lithuania’s Cash Service. Various exhibitions and other events for the public are constantly organised.